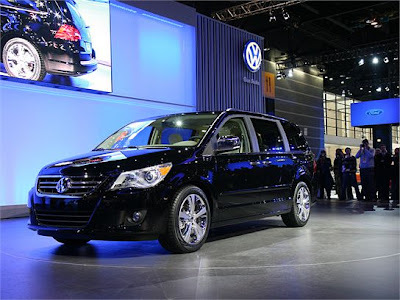 If you watched tv at all on Saturday you must have seen the media blitz on the new VW Routan Boom.. This might be the minivan that wins my heart. Purchase one and they will put $1500 in your Upromise, not a bad side note. I do love me a VW. It's sleek, it heirs a little more on the side of a crossover, not so mini van-ish and wait for it............ it has 13 cup holders.... Yes, I said 13 cup holders!!! I think I likey. I love the Routan. It's so cute and definitely more stylish. But for now, I'll have to stick with my Honda Odyssey. 13 cupholders??? Holy crap, batman! Do you know how many bathroom breaks that would mean??? And I have to say, it is cool looking for a minivan. But why do VW's have to cost so much???? Their new small crossover vehicle STARTS at $35,000. I'm like wh-what? I can get a BMW for that price! I still say, "never!" And, I'll go down fighting if I have to.. Anything with 13 cup holders is definatley rockin!